This approximate 1-hour aerial sightseeing tour is the most cost-effective way to see the Grand Canyon and appreciate its majesty and beauty. Fly over beautiful Lake Mead and along side the incredible Hoover Dam before flying to the West Rim of the Grand Canyon for breathtaking views of the Grand Canyon and Colorado River. Begin with pickup from your select Las Vegas hotel and make your way to the Boulder City airport by coach. 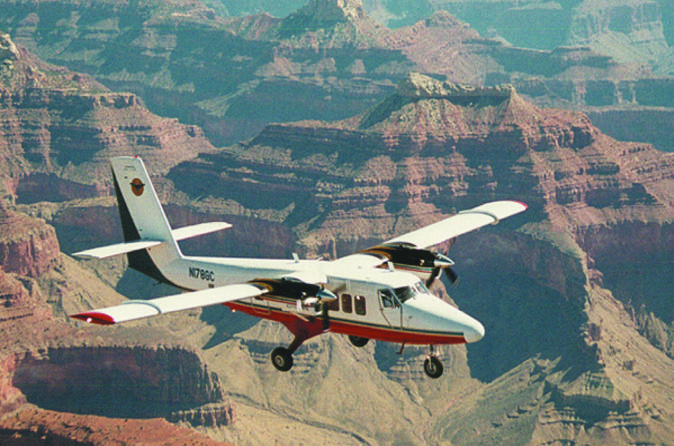 There, meet your pilot and hop aboard your 1-hour flight above the Grand Canyon’s spectacular West Rim. Enjoy aerial views of Lake Mead, the Colorado River, and the Hoover Dam, one of the great engineering marvels of the 20th century. You'll have unobstructed lines-of-sight from the sightseeing plane’s panoramic windows and experience the full scope of the desert landscape. Swoop above the canyon’s most iconic viewpoints before flying back to the Boulder City airport for a transfer to your Las Vegas hotel. Early birds: opt for the first departure time to catch the sunrise and return to Las Vegas with a full day still ahead of you. Special Offer - Book an Early Bird departure and save 19% OR save between 5% and 19% compared to the local supplier's prices for all other departures! - Book Now!